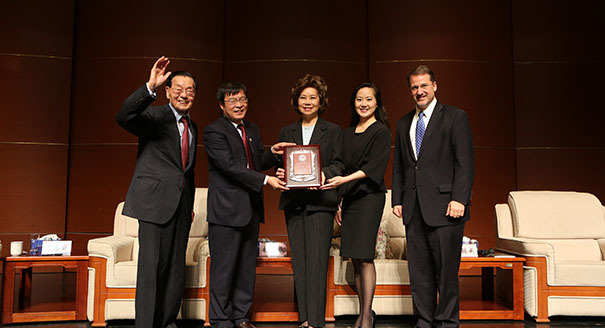 Angela Chao, Deputy Chairman of the Foremost Group, joined members of her family recently for a roundtable discussion sponsored by the Carnegie-Tsinghua Center for Global Policy, on the topic of East-West Cultural Exchange. Recognizing the rising position of China across all spectrums of the international community, the Center felt it was timely to address the importance of education and the facilitation of people-to-people exchanges between China and America. ​On the topic of Sino-US relations, Angela stated that this is the most important bilateral relationship in the world today. She observed that while many people see the growing influence of China on the international scene and share increasing respect for the contributions being made by the Chinese people, they are still many who are somewhat fearful of the Asian nation. For this reason, says Chao, cultural exchanges are so vitally important: in order to gain understanding of cultural differences and to forge long-term friendships and partnerships. The Chao family were perfect panelists for this discussion, having invested their personal lives in the mission of bridging two cultures: their Chinese and their American heritage. Angela’s parents, Dr. James S.C. Chao and Mrs. Ruth Mulan Chu Chao, Chinese immigrants, taught their children the importance of embracing and respecting their roots both in Asia and the US, and taking the best of both worlds to forge a path for individual success. Angela Chao concluded her contribution to the Carnegie-Tsinghua Center's event by emphasizing that in this century, citizens must think globally and locally, accept and appreciate unfamiliar cultures and traditions, and have a constant passion for sharing their own heritage at every opportunity.